Cheyenne River Sioux Chairman Harold Frazier speaking to water protectors today. Frazier said he is asking lawyers to file for eminent domain of the land here. Frazier also said Cheyenne River Lakotas will be arriving on Monday. Our numbers are needed now, he said. 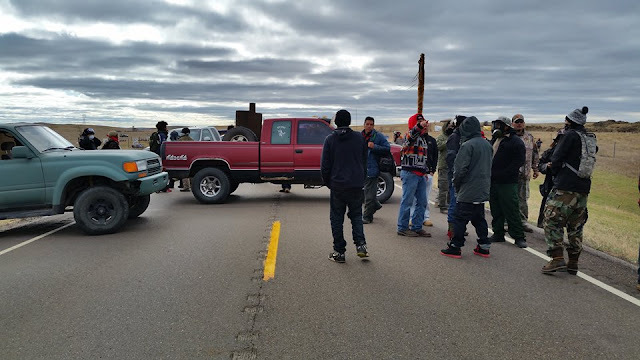 (Sunday 1:00 pm) Approximately four hundred (400) of our people have blocked Highway 1806 at Standing Rock. This is almost the entire encampment. They've used their vehicles and are gathering (Our people). The police are starting to make arrests. Cell reception has always been spotty there. So, someone will be uploading videos soon. Those who are near are asked to gather for another non-violent demonstration tomorrow, Monday. Expect to get pepper spray used on you. Do not resist. Expect to go to jail. Do not resist. If your heart and mind are set on violence, then stay home, this is a non-violent protest. My Elders have spoken. Respect their, our, wishes. On Saturday, there were 126 arrests, including two juveniles, and on Sunday, one arrest. The total arrested so far: 269. Standing Rock water defenders race forward to protect sacred after being attacked and beaten with police batons, and pepper sprayed on Saturday. BREAKING: WATER PROTECTORS CROSSED BARBWIRE FENCE DIRECTLY ON PIPELINE ROUTE, HWY 1806, NOW SETTING UP TEEPEES. COME TO STANDING ROCK, NOW. 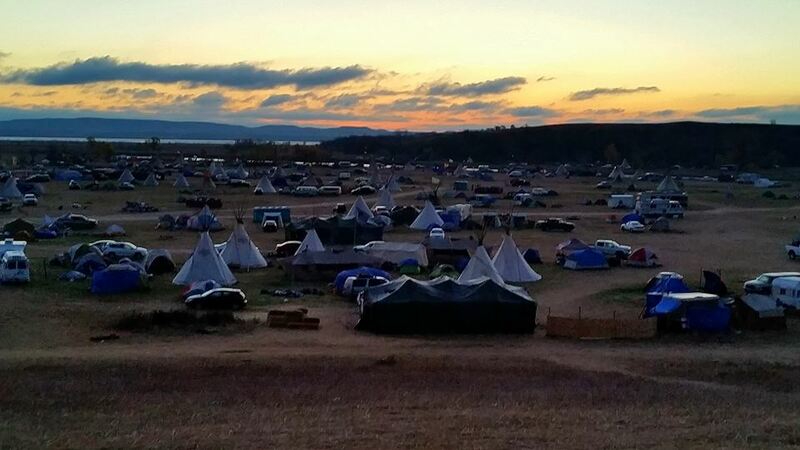 Goodmorning from Standing Rock. Today there is an urgent energy felt in camp, especially after yesterday's 83 arrests, and with the pipeline coming closer to highway 1806, and Lake Oahe/ Missouri River. At 5:30 a.m. all the campers were called upon, and I don't often rush to the main fire so early in the morning. I was drawn to the passion of the speaker and recorded audio, some of it I transcribed here: "Everybody in camp needs to wake up and rise up. We need every able body to come and stand with us today. They (DAPL) want to say they have eminent domain, they want to say the have right to poison us and our children. Today we're going to take back our land, we're here to stand up for the rights of those who aren't here yet, those ones that are unborn. 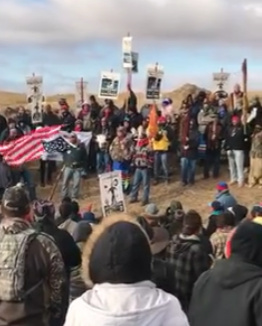 We're the warriors that were sent here by the spirits to stand up, our warrior spirit brought us here together united, our unity is our strength, our prayer is our power, we need the camp, every single camp to rise up and come be a part of this today, we're going to stand and take back our land today. We're going to control and protect it." The people marched to Sacred Ground Camp, which is ground zero of the pipeline route and have just crossed over the barbwire fence to set up teepees and a trailer, adding bodies and expanding the camp at Sacred Ground. 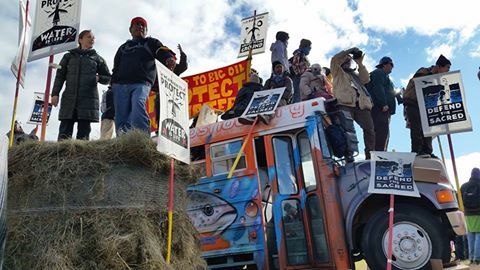 Yesterday a total of 83 water protectors were arrested, today everyone marched to the front lines where the black snakes lies, the head has just about reached our sacred water and will be trying to cross... Unci's n Lala's... Fathers n Mothers, Children and the youth have begun to protect and fight these police and their huge oil corporation with peace and prayer. Some of the oyate that were arrested have not been located as they were moved to different jails around North Dakota, it is really tense and serious right now and we are calling for more warriors to come and help fight this poison pipeline! 300 + tribes united here, many have raised their flags here in support but now we need them to come back and support the Oceti Sakowin. "The warriors on the frontlines are so brave and courageous! If you're sitting at home in the comfort of your own, do not throw negativity into your thoughts for these brave warriors. Instead pray for them. They have chosen to take a stand against a billion dollar company and we all know how desperate the company is. Take a stand with the WATER Protectors and pray with your glass of water every day. Think about these relatives walking down the dirt road and narrow paved roads of their land. They braved the cold, skipped their cup of coffee, left loved ones behind to show solidarity with their brothers and sisters. Pray for them. 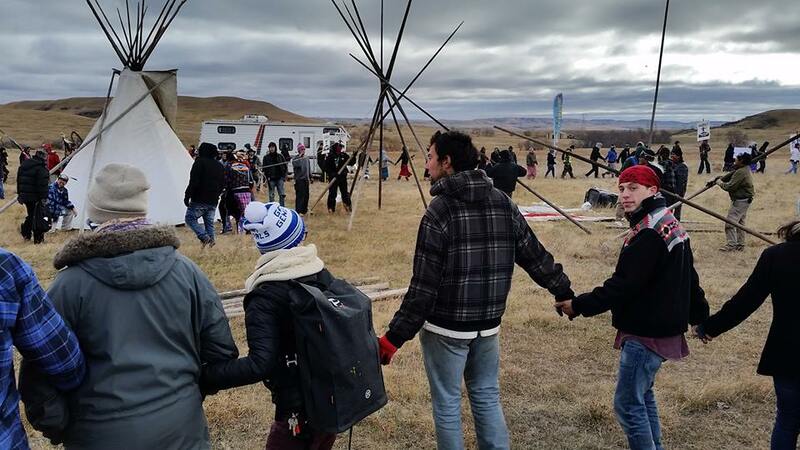 It doesn't matter who you pray to what language, take a moment and think about the Standing Rock Sioux Tribe and all the relatives, young and old, and in between bravely caring their chanupas, their tobacco, their prayers, their heart and soul, this is everything they are and represent. 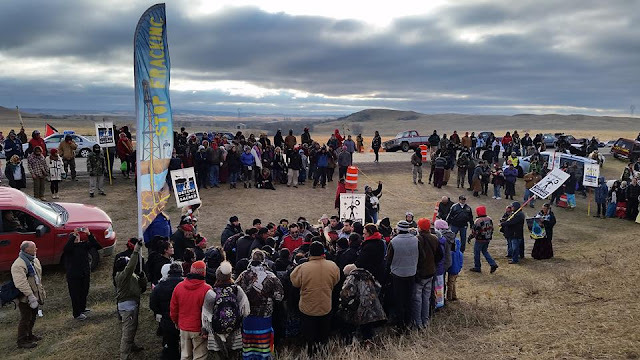 The sacred water, the Missouri River gives life to more than 18 milllion people, and it will be all over when the pipeline breaks and we watch in horror of the black snake spilling its guts into the once sacred river. We can only imagine the silence of the animal kingdom and the plant kingdom! No one speaks for them! We forget, we are all one in this cycle of life. We pray for our future generations and those yet to come. Stand for your rights as human beings. Mother Earth is in distress." 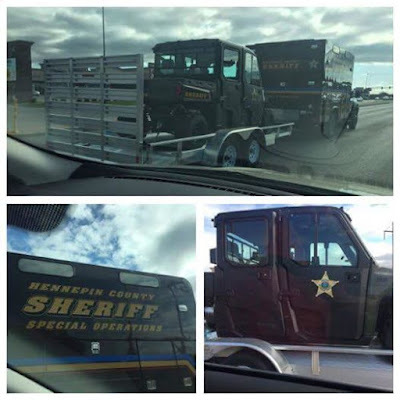 Below: Hennepin Sheriff sent special forces to terrorize Standing Rock water protectors -- after Minneapolis and Saint Paul passed resolutions of support for Standing Rock's resistance to DAPL and protection of the water. 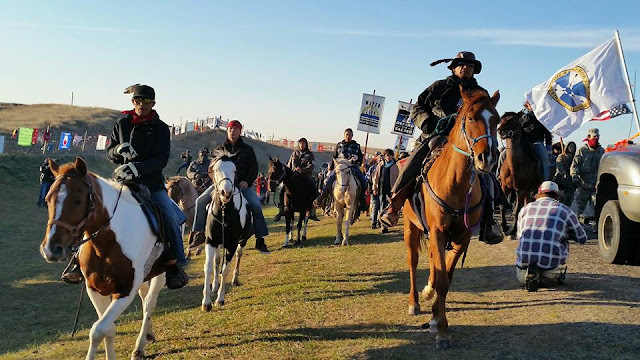 Minneapolis was the third city in the U.S. to pass a resolution in support of Standing Rock. This is ab fight for Mother Earth. Victory will come to those that are indigenous and just. Thank you to all of the water protectors! The entire world is watching and cheering you on! You are so brave to protect our water! We are sending you prayers! You are making history! The Missouri River is a source of water for millions of people! You are truly amazing! God bless you! America at war with its own people! So this is what its come to ? Citizens have a right to assemble & voice their opinions. Freedom of press, freedom of speech, freedom to assemble, except when it comes to American Native Indigenous people ? 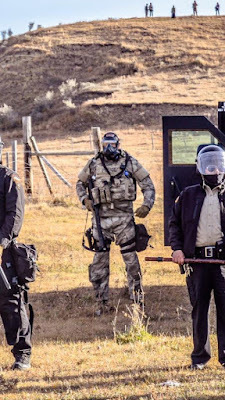 Some water protectors have done NVDA, but why are masses of people being rounded up and arrested without breaking any laws? 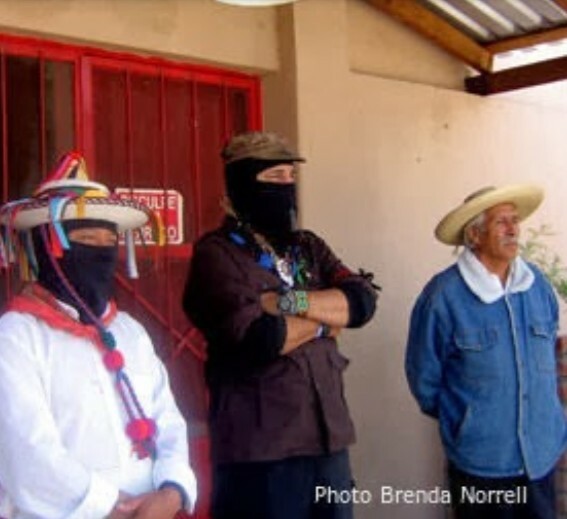 USA mass incarceration of a people expressing their spiritual beliefs to protect water as medicine, as a source of life, as a necessity for survival, in protection of burial grounds; America has become a disgrace to itself! Just watch the presidential debates; there is an absence of leadership and an all time low of even pretending to be morally accountable. Even worse are the supposedly conservative candidates who have bargained their souls to try to be elected. 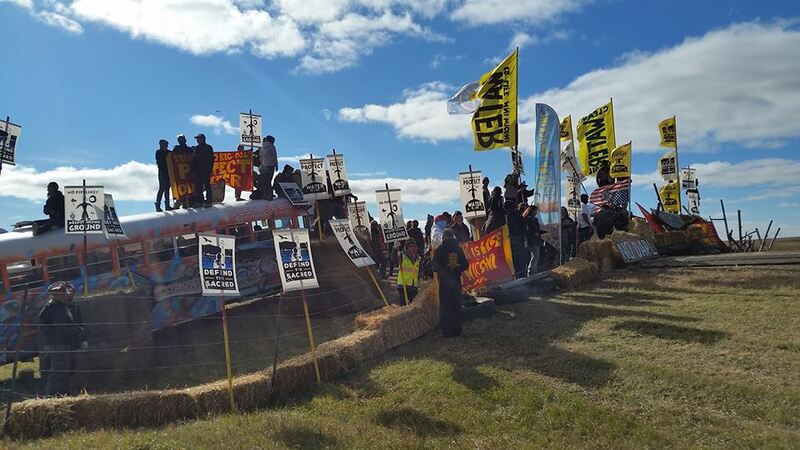 Elect people like the water protectors who have a vision of life for our futures. Support the water protectors who have actually tried to make our earth habitable, to give the children a future, to be creative, positive, caring, and to be intelligent and open to harmony and balance in life.